The Rosemount 5300 Guided Wave Radar (GWR) level transmitters from Emerson Process Management have been certified to IEC 61508 for safety instrumented functions up to SIL 3. Performed by the independent global organisation exida, the functional safety assessment covered SIL 2 rated safety applications in a single configuration, and SIL 3 rated safety applications in redundant mode. The certification makes the Rosemount 5300 GWR level transmitters suitable for continuous level measurement in safety instrumented functions up to SIL 3, as defined in IEC 61511 for applications in the process industry. 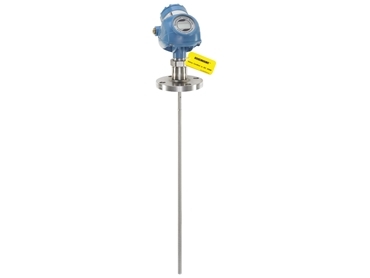 The IEC 61508 certification of the level transmitters will benefit process industries across oil and gas production, refining, petrochemical, chemical and power segments who can now be assured of accuracy, reliability and flexibility of the 5300 Series GWR in safety-critical level applications such as overfill prevention and dry pump protection. Delivering all the benefits of continuous level measurement, including the actual product surface location, the Rosemount 5300 Series is a two-wire GWR for challenging level and interface measurements on liquids, slurries and solids. The Direct Switch Technology (DST) function increases measurement reliability and capability in addition to improving the signal-to-noise ratio, and enhancing the ability to handle disturbing factors, longer measuring ranges, and lower dielectrics with a single probe. Advantages of the Rosemount 5300 GWR also include maintenance-free operation for improved uptime, and advanced configuration and extensive diagnostic information available through the RadarMaster and EDDL-based user interface. The high and low level alarms are set up locally or remotely during the installation and configuration process.